Just launched outta Long Beach by an entrepreneurial dude who also sells solar-powered cell phone batteries (so yes, to answer your question, this dude is killing it), Mixie's making exclusively small-batch, small-framed, fixed-gear-meets-BMX-style bikes, which're very different than DMX-style bikes, as those are much Ruffer to Ride. Bikes are limited to just 60 per design, come in a Benetton ad's worth of colors (neon green/sky blue/the black-and-white "tuxedo"), and're available in two styles (both of which're lightweight enough to carry and small enough to fit in the trunk or backseat of a car): the classic, 10-speed-esque "Straight Edge", and the more compact-looking "CrissCross", which is always a good thing to have around when you miss the bus (and that is something you will neverevereverdoagain). The two-wheelers're also enhanced w/ crazy-looking design details on the handlebars/seat/pedals, ranging from stickers made from customer-generated art, to ostrich skin, to faux crocodile, mostly so you can look at other people's rides and say, "Sorry mate, that's not a bike. 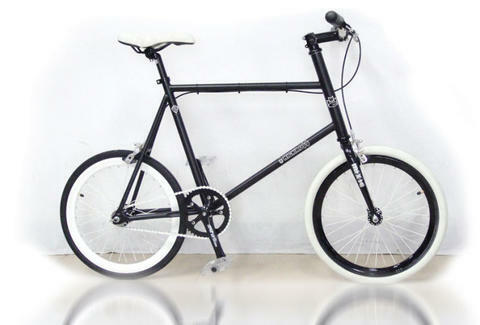 This is a bike! "...and then cut up their leather jackets with a huge Bowie knife.